You will start this adventure in the city of El Paso, Texas, where you will rent a car and immediately head South towards the United States border with Mexico to the Big Bend National park. This park is one of the largest parks in the continental United States, and also one of the most beautiful. With a wide array of landscapes, from desert, to forest, to mountains, there is a lot to see in this beautiful park. After spending some time enjoying Big Bend, you will head back North to Guadalupe Mountains National Park, which features some of the largest mountains in the American Southwest. From there, it is only a short drive to Carlsbad Caverns National Park, which features one of the largest cave systems in the world. You will get to learn about how the cave was formed, how it has been used throughout history, and just marvel at its size and complexity. As soon as you have had your fill of the cave at Carlsbad Caverns, you will take another short drive to White Sands National Monument. This may just be my favorite public land on this trip as the landscape at White Sands is absolutely breathtaking. Make sure you get there for sunrise or stay for sunset as these are the most beautiful times of day to view the white sand dunes. When you have finished enjoying the beautiful vistas at White Sands National Monument, you will continue your trip West until you get to Saguaro National Park near Tucson. Within the park, you will find the legendary giant cactuses that give the park its name. If you are looking for some additional things to check out between White Sands and Saguaro, you can stop in the town of Tombstone, Arizona to relive some of the adventures of Wyatt Earp, Doc Holiday, and the shootout at the OK Corral. Once you reach Saguaro National Park, have your camera ready to take plenty of pictures. The Saguaro cactuses can grow as tall as a telephone pole and are absolutely amazing to see in person. When visiting the park, please note that it is split in half by the city of Tucson, where you will finish your trip. Once you have finished checking out the amazing cactuses in Saguaro, you can head to the airport to return your rental car and fly home. With a total drive time of roughly 19 hours, this road trip is the shortest road trip in my series. You could probably complete this road trip in 8-10 days, but in order to really see and appreciate these unique landscapes I would recommend scheduling a bit more time and enjoy these beautiful parks. 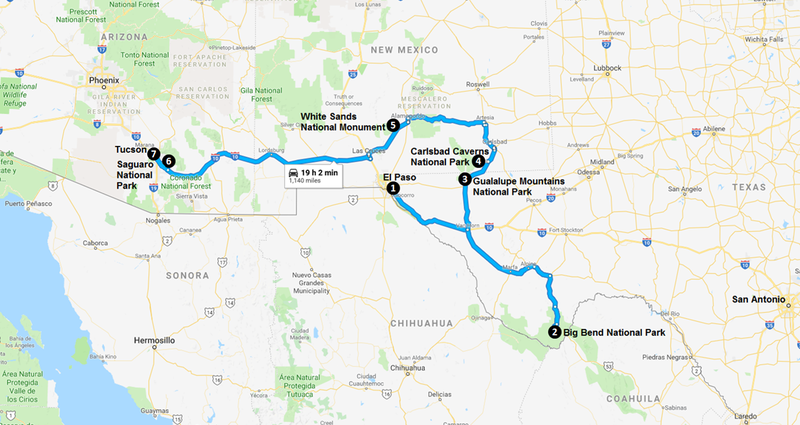 Below you will find an itinerary that I set up for a 12-day road trip thru the national parks and public lands in Texas, New Mexico, and Central Southern Arizona. You will start your trip in beautiful El Paso, Texas, which is near the Southern US border with Mexico. As soon as you land in El Paso, you will rent a car and head South towards Big Bend National Park. When you book your flights, make sure you book a multi-destination flight where you fly into El Paso, Texas, but fly home from Tucson, Arizona. The same thing applies to your rental car. Make sure your pick-up location is El Paso, but your drop off location is Tucson. If you would like to take a day or two to explore the city of El Paso before heading South, there are a lot of great things to do in the city. As soon as you arrive at Big Bend National Park, you will be blown away by the beautiful vistas and the diversity of the landscapes that you find within the park. You will want to spend at least a few days at Big Bend National Park, as it is one of America’s larger parks and there is so much to see and do at the park. If you are up for doing some hiking, I would strongly recommend getting out on some of the trails and enjoying the beautiful back-country in Big Bend. Once you have finished visiting Big Bend, you will want to head back up North to Guadalupe Mountains National Park, which is two hours East of El Paso. Guadalupe Mountains National Park is a breathtakingly beautiful park, but it is also one of the more difficult parks on this itinerary to adequately experience without hiking. With a vast majority of the park in what is considered back-country, you will need to make sure you have your hiking boots ready when you visit Guadalupe Mountains National Park. If you are up for the challenge, you can even climb to the top of Guadalupe Peak. As soon as you have finished exploring Guadalupe Mountains National Park, you will start to head Northwest into New Mexico where you will make the short 30-minute drive to your next stop at Carlsbad Caverns National Park. If you aren’t afraid of bats, then you will absolutely love Carlsbad Caverns National Park. This amazing labyrinth of passageways and large caverns forms one of the largest cave networks in the world. If you are feeling adventurous, you can enter the cave thru the natural entrance and make your way thru the cave on the lighted pathways. For those who may not want to spend as much time hiking thru the caves, there is an elevator in the visitor center that will take you down into the heart of the caverns. As soon as you have finished exploring Carlsbad Caverns, you will continue heading west towards White Sands National Monument. Make sure you have your camera out when you visit because the views you are going to see at White Sands are out of this world. In my opinion, White Sands National Monument may just be America’s most beautiful national monument. These beautiful white sand dunes were created because of an underground water table that keeps the ground moist and prevents the sand from blowing away. I would try and plan on being at White Sands during either a sunrise or sunset, as the white sands are absolutely breathtaking under a colorful sky. Once you have had your fill of beautiful sunrises and sunsets at White Sands, you will continue heading West into Arizona towards Tucson and Saguaro National Park. If you are looking for a stop to break-up your drive, I would suggest making a stop at Tombstone, Arizona, which isn’t out of your way at all. Here you will find the site of the legendary gun battle at the OK Corral, which is reenacted on a daily basis. There is also some great restaurants and souvenir shopping if you are so inclined. Once you reach the Tucson area, your next stop will be Saguaro National Park, which is divided in half by the city of Tucson. You can spend the next few days exploring this beautiful park that is filled with giant Saguaro cactuses. If you are into hiking, there are some amazing hiking trails throughout the park, but you will want to make sure you have an ample amount of water before setting out on your hike. As soon as you have finished touring Saguaro National Park, you will need to make your way to Tucson where you will return your rental car and catch your flight home. If you have some extra time to spare, you can check out the city of Tucson, which is beautiful. There is a lot to see and do in the city, so scheduling an extra day or two to unwind from your road trip is a great option. Without a doubt, the worst time to make this trip is during the Summer months of June thru August as the scorching hot temperatures can be miserable if you aren’t used to them. The Winter months of December thru February are great, but nighttime temperatures can be quite cool. I would suggest either visiting during the Spring months of March thru May or the Fall months of September thru November. During these times of the year, the temperatures are very moderate and the crowds are much smaller. On our road trip this past summer we decided last-minute to skip Carlsbad and attach it to a future itinerary that would also include Guadalupe Mountains National Park. Now I’m really excited to get back there, so thank you! This is my old home. I grew up in El Paso, and spent lots of time with my Dad exploring these areas. The Chihuahuan desert of west Texas on into New Mexico and Arizona is harsh, and yes as you mentioned summers can be brutal. But at the same time there is an interesting and fascinating beauty to the Southwest as well. And well, White Sands is spectacular as you now know. I hope you had time to hike around in the dunes getting away from the parking areas. Then you really get to experience the feeling of the place. Almost no one ventures past those first dunes. Going into the heart of the gypsum dunes is just indescribable. But take a GPS and know how to use it as it is easy to get disoriented. Thanks for the great post. Hi Tim. I did get to explore past the first dunes, and as you said, it was absolutely amazing! I need to get back there again soon. One of my favorite park lands I have visited. Cool Josh! I am glad you had the time to really get into the monument. I still really love New Mexico. Great laid back culture, and so much diverse beauty.